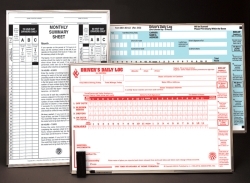 The Daily Log Melamine Board Chart with Aluminum Frames 877-R is an enlarged copy of our 601-L log book. This is useful when teaching your drivers how to fill our their logs by showing them - with an oversize reproduction of the actual log book. This giant log chart makes a great driver training tool. This chart includes an aluminum frame with wall hooks for mounting, and includes a marker, eraser, and oversize log ruler.